Although the Garcia family has been crafting some of the world’s best cigars for some time, including their breakout success with Pete Johnson’s Tatuaje brand, it wasn’t until 2009 that their own My Father brand started gaining serious acclaim—following a head-turning ranking as Cigar Aficionado’s #3 Cigar of the Year for 2009. My Father Cigars has since gone on to win multiple other accolades, including the prestigious #1 Cigar of the Year designation (2012 & 2015). The brand has expanded well beyond the original, eponymously titled “My Father” blend, including two sister blends—My Father Le Bijou 1922 and My Father Connecticut. Now, the Garcia family has introduced the latest expansion to the legendary My Father lineup—My Father The Judge. Donning a recreation of an antique, Victorian lithograph circa 1905, The Judge takes on the posh look of sophistication. It was reportedly inspired from a friend of the Garcias, whom happens to share the judiciary occupation. For this new take on the brand’s flagship cigar, the Garcias have opted to showcase a fuller-bodied experience. A double binder of Nicaraguan Corojo and Criollo tobaccos envelops a special selection of Nicaraguan tobaccos, harvested from three of the Garcia’s own farms (La Bonita Two, El Pedrero and San Rafael). This is where the blend derives its strength, which has been cleverly disguised by a sweet, dark brown, Sumatra Oscuro wrapper. 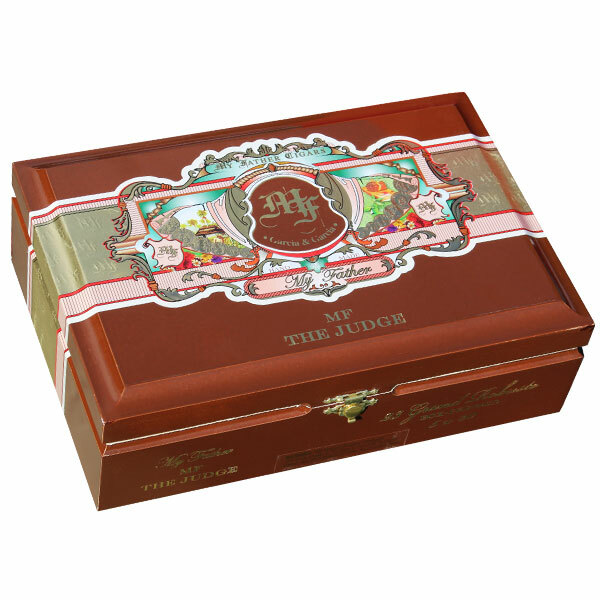 Box-pressed and rolled in two commanding sizes (6x56 Toro and 5x60 Grand Robusto), The Judge is an intense smoking experience, chock-full with palate-smacking flavors for the enthusiast.